Chicken satay with peanut sauce is a party favourite, but also makes a delicious starter. The creamy, slightly sweet sauce in Sally's easy chicken recipe perfectly complements the sticky, tangy meat. Thailand, Malaysia, Indonesia and even Singapore lay claim to the original chicken satay. All the recipes differ slightly but with the same main elements of marinated chicken, which is skewered and grilled, and a peanut dipping sauce that should be sweet, salty and slightly acidic from the addition of plenty of fresh lime juice. 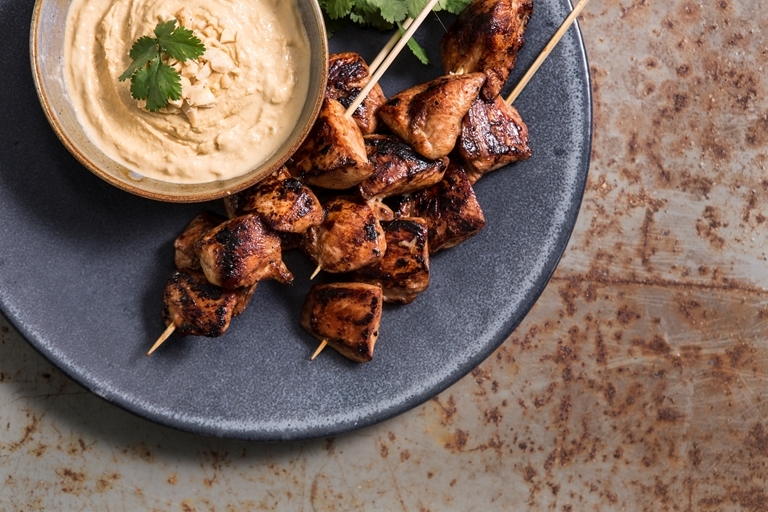 Whatever its origins, chicken satay is a popular dish and always goes down well at barbecues, parties or family meals, as it can be made start to finish in under an hour. It is great served with rice or noodles or simply on it its own.